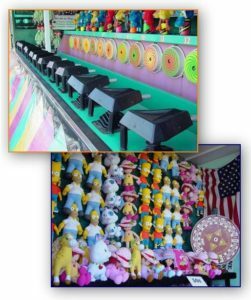 Campy’s Blue Star Amusements, LLC, an NJBIA member since 2004, has been providing such fun and excitement since 1969 as one of New Jersey’s best family-owned mobile amusement parks. They provide their services to organizations throughout the state in hosting about 30 events per year. With an inventory of 20 mobile amusement rides, 18 modern games of skill and extensive experience in delivering fun and profitability to groups that host them, you can be sure a Campy’s-produced event is one that will be rewarding for all. Rocco Campanello founded the company in 1969 with the mantra to provide “clean entertainment for families,” which has been the fulcrum that has driven their success that now spans more than 45 years. In 1972, Rocco’s son, Robert, took over the leadership of the company, and in 1976 he was joined by his wife, Ann. Today, Campy’s is run by Robert and Ann’s children, Keith and Karyn (nee Campanello) Pampanin, and Karyn’s husband, Paul, the third generation to take the helm. Campy’s makes it easy for an organization to host an event, most of which do so for fund raising purposes. They pay the host organization a percentage of the gross of both the ride ticket and game sales. The only real hosting expense is for security, restrooms and refuse containers. They carry their own liability insurance, provide their own electricity in the form of three mobile generators and supply all the labor required to assemble, operate and dismantle the equipment. The only assistance they really need is in the form of ticket sellers and adequate staff to operate the games. Make no mistake about it, operating a mobile amusement park is a professional endeavor and that certainly extends to safety and maintenance. 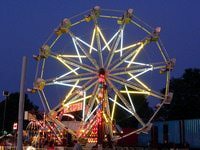 Not only are rides and electrical components checked by state inspectors at each event, but they also have their own mechanic on staff, certified by the National Association of Amusement Ride Safety Officials. During the off season, they are devoted to refurbishing their equipment so when the new season starts, it’s all systems go. What fun would an amusement park be without the great names of the rides? Campy’s has the Cobra, Octopus, Gravitron, Ring of Fire, Scrambler and Sky Diver as well as the rides for young children, including Superslide, Carousel, Dragon Wagon, Tea Cups, and (my favorite) the “Berry Go Round.” Of special interest, a Campy’s amusement part was used as the setting for a scene from The Sopranos. Congratulations to the entire extended Campanello family for such long-term success in providing fun for thousands of New Jersey residents and out-of-state tourists each spring and summer. For more information about Campy’s Blue Star Amusements, visit their website or Facebook page. Campy’s is just one of 20,000 companies that comprise NJBIA’s membership, which is very diverse with representation from an amazingly large and wide spectrum of fields, industries and professions. Look for more unique stories about NJBIA members in future issues of “Beyond 10 West Lafayette,” NJBIA’s membership blog.